Mountable to any flat surface. 4 bolt holes are predrilled. 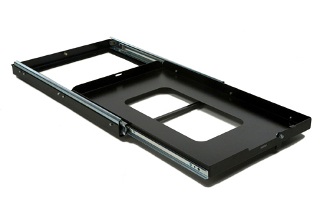 High strength, sealed bearing drawer slides allows the tray to extend from the anchored base nearly 100%. An adjustable wedge pin design keeps the slide rattle free when closed. A swivel latch securely locks the drawer in the closed position. Fridges are typically secured using a ratchet strap from a mounting point on the fridge slide to the handle of the fridge. You supply the necessary bolts, nuts and washers as vehicle fitment varies greatly by taste, vehicle type, year, etc. We mounted the slide to the floor in the cargo bay of our Jeep JK using 8mm nuts and bolts. Drilling was required. FULLY EXTENDED: 145 cm / 57.1"
Suitable for holding the National Luna 40l, 50l, 52l, 65l fridge/freezers, the Engle 30 & 40L, and any other fridge with a footprint no larger than 16.3" x 27.7"